With the constant support of dexterous crew of technocrats, we are fulfilling the varied requirements of clients by manufacturing optimum quality Brass Round Tower Bolt. We are actively engaged in offering a qualitative range of Brass Tower Bolt for catering the diversified requirements of our clients. 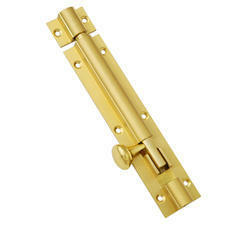 Being a well-established organization, we are engaged in offering a distinguished range of Brass Round Tower Bolt. Approx 20 Rs to 500 Rs per piece as per quality and size. Being a leader in this industry, we are devoted towards providing a premium quality array of Brass Fancy Round Tower Bolt. Approx 400 Rs to 1200 Rs per kilogram as per quality and market. With the valuable assistance of skilled team of professionals, we are engaged in offering an extensive range of high-quality Brass Round Tower Bolt. 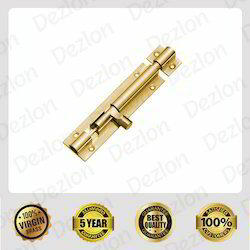 With sincerity and hard work of our professionals, we have carved a niche for ourselves in this domain by providing a premium quality gamut of Brass Half Round Tower Bolts. Price : Rs 100 to Rs 200 per piece as per quality. With sincerity and hard work of our professionals, we are manufacturing a premium quality gamut of Brass Round Tower Bolt.